Families visiting Atlanta with kids can find plenty of fun places to eat. By choosing a few special dining experiences, mealtime can be a memorable vacation highlight in addition to your sightseeing adventures. 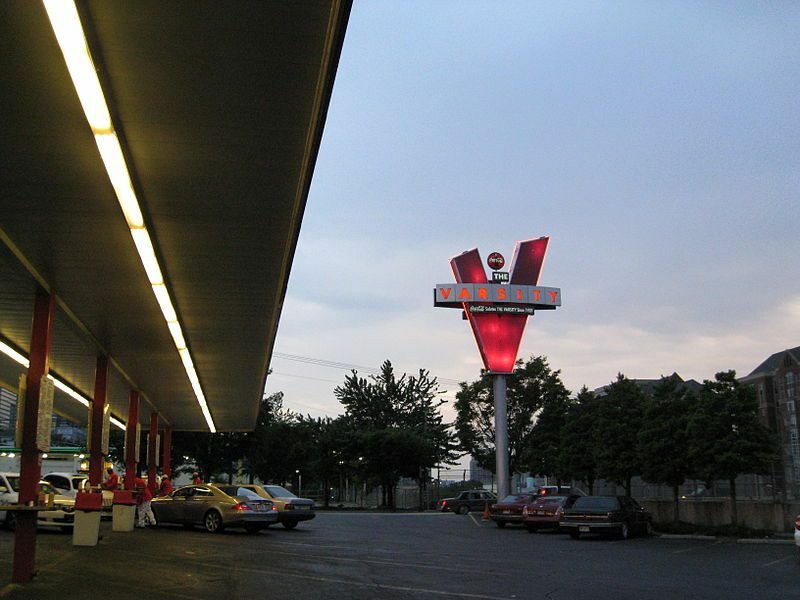 Considered by many locals and visitors alike to be an Atlanta highlight, The Varsity in downtown Atlanta is dubbed the World's Largest Drive-in. Situated on more than two acres, this landmark drive-in restaurant is able to accommodate 600 cars and over 800 people inside. Serving Atlanta since 1928, it is one of the nation's original drive-in restaurants and popular menu items range from an array of hot dog and hamburger variations to traditional side orders and the famous Frosted Varsity Orange shakes and fried pies, all made from scratch daily. While there are several locations around the Atlanta area, the downtown location is the original and the best choice for visitors to enjoy the full experience. Love it or not so much, a visit to The Varsity is sure to be something you will remember. Located at Discover Mills in Lawrenceville, Georgia, about 30 miles northeast of Atlanta, this arena dinner show features a medieval banquet served 11th-century style without utensils and an arena show, complete with knights, pageantry, jousting, romance, magnificent horses, colorful costumes, original music and more. The castle opens 90 minutes before show time, so plan to arrive early as seating is first-come, first served. Also, it is definitely worth checking the website for special offers and discounts before making your reservations. Opened in 2006, this is the ninth Medieval Times Dinner and Tournament location in North America and the third in the Southeast U.S. Other Southeast U.S. locations are Myrtle Beach, South Carolina and Kissimmee, Florida near Orlando. If you are traveling with children who have American Girl dolls, or if you are planning to purchase one (or more) American Girl dolls, a visit to the Atlanta area American Girl Boutique and Bistro could very well be the highlight of your Atlanta visit, at least for your young family members. Located in Alpharetta, Georgia at the North Point Mall, about 25 miles from downtown Atlanta, this is the only American Girl store in the Southeast U.S.
For a memorable dining experience, the Bistro serves brunch, lunch, afternoon tea, and dinner on scheduled days and there are frequent special events. You will need to make reservations for dining and for some special events, so remember to visit their website well in advance of your trip. For an upscale family dining experience, consider planning to have lunch, dinner or Sunday brunch at the famous Sun Dial Restaurant. Conveniently located in the heart of downtown Atlanta, this revolving restaurant sits at the top of the Westin Peachtree Plaza hotel, which at 723 feet high is the tallest hotel in the western hemisphere. The restaurant serves contemporary American cuisine and there are lunch and dinner Kid's Menus for children ages 12 and under. Keep in mind that the Sun Dial Restaurant dress code calls for proper attire at all times. Casual clothing is okay during lunch hours; however, during dinner hours casual business attire is required and diners should refrain from wearing very casual daytime attire such as athletic gear, shorts, flip-flops, and hats. With over 130 locations around the globe, Hard Rock Cafes feature extensive menus of casual American cuisine and lively decor complete with memorabilia from many of the world's greatest rock legends. The Atlanta Hard Rock Cafe, which opened in 1992, is conveniently located across from the towering Westin Peachtree Plaza hotel and next to the Peachtree Center MARTA station. If you are staying or sightseeing in downtown Atlanta, this themed restaurant may be a fun choice for lunch or dinner, depending on the ages of the children in your group. Yes, Hard Rock Cafes are touristy restaurants, but the atmosphere appeals to family members from school-aged kids to grandparents and the menu offers something for all ages. A Kids Menu is available for ages ten and under. If you go, expect older kids to want to visit the Rock Shop to buy tee shirts, collectible pins or other popular souvenirs. Two Atlanta locations of this create-your-own-stir-fry restaurant feature an array of fresh noodles, rice, vegetables, sauces, meats, seafood and spices from which diners select their own ingredients to be prepared by the chefs. The atmosphere is casually upscale and lively, and diners of all ages enjoy the interactive aspect of these popular restaurants. A local favorite for healthy homemade soups, sandwiches and salads and baked goods, this neighborhood café in Buckhead offers a nice alternative to typical restaurant chain food in a casual and welcoming atmosphere. On most days, the café closes at 5 or 6 p.m. and during the last hour only take out orders are accepted. On Thursdays, however, Souper Jenny's stays open until 10 p.m. for popular Grilled Cheese Night. The servers double as performers in local theater and frequently restaurant guests will be treated to a bit of impromptu entertainment. Cash only is accepted and they request that guests put cell phones away while dining. Serving lunch and dinner daily, Mary Mac's Tea Room has been cooking traditional Southern favorites from scratch for Atlanta residents and visitors, including many celebrities, since 1945. Pencils are provided at each table and guests fill out their own orders. Menu items may be ordered à la carte or diners with big appetites may choose the all-you-can-eat Southern Specials served family style. Children 10 and under may order from the Kids Menu for just $4.95 (subject to change). Closed Christmas Eve and Christmas Day.